It was my husbands birthday earlier this month and had a dinner party for him at home. And since i had been taking cake decorating classes, i wanted to make a cake that wasn't filled with flowers but also something fun. I started looking around and came across a few IPhone cakes. Now for those of you who know my husband Jigar, he's always on his iPhone, or on the computer or taking pictures!! I said to myself with a big smile, "I can totally make this!!" A week before the dinner party, i started making the applications for the phone. A day later, i re made all the applications over again because the 1st set wasn't good enough for me. I am so glad i redid them. This cake was one layer butter cake and one layer Chocolate cake with Blackberry Swiss meringue filling. All made from scratch!! i wish i had taken a picture of the cake sliced. I would have hoped the black fondant on the cake would have been a little smoother. I had rolled out the fondant and placed it on the cake, only to realize that i had to move it over. And that caused the surface to get a little bumpy :( . Writing on the cake after the applications were put on wasn't easy either! I made some royal icing for writing and using colored piping gel for some of the application. I was super stressed and didn't want anything to go wrong. The party was just 3 hrs away!! When i completed the cake and packed it away in a cake box, i had a sense of relieve. It was a good relieve and huge smile. I was so proud of myself for actually doing it!. It felt even better when my husband looked at the cake and gave me a big hug . All our friends stood there looking at the cake with their iPhone in their hands. After which, they all took a picture of my cake:). This is just the beginning. I have my daughter's 2nd birthday coming up in April and i am already planning her cake. Hopefully some day, I'll be able to get in orders for cakes and cupcakes because i just love baking and decorating! 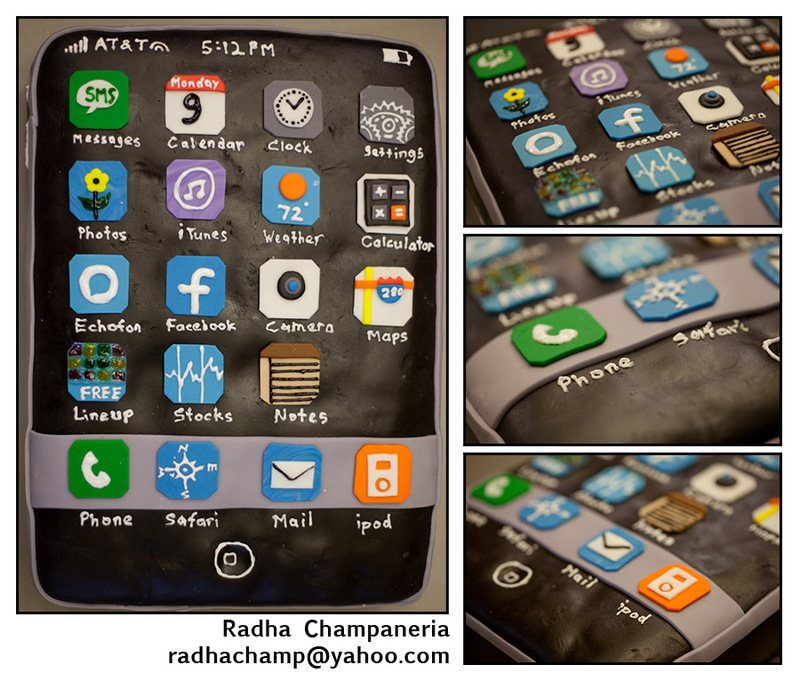 Radha, I work at Cisco and am a lucky benefitter of your husband's photography skills :) I just have to say the iphone cake looks absolutely gorgeous! I can't even imagine the amount of work you must have had to put into it! I'm sure Jigar was very proud of you! Thanks Noela! That's very nice of you:) I'm very proud of Jigar and definitely appreciate his photography skills.It makes me feel very hapy to know he inspires others!